Beyond billing error detections: Testing for the sake of testing and compliancy! It is common knowledge that the main mission of revenue assurance professionals is the protection of the telco’s revenue streams. In fact you have to deal with various constraints defined by several third parties: Financial regulation (eg SOX), Telecoms regulation, Consumer rights rules…so are you able to demonstrate that the controls you implement are efficient and that there is no missing piece in the monitoring coverage? Your Audit team might request you a proof of compliancy! 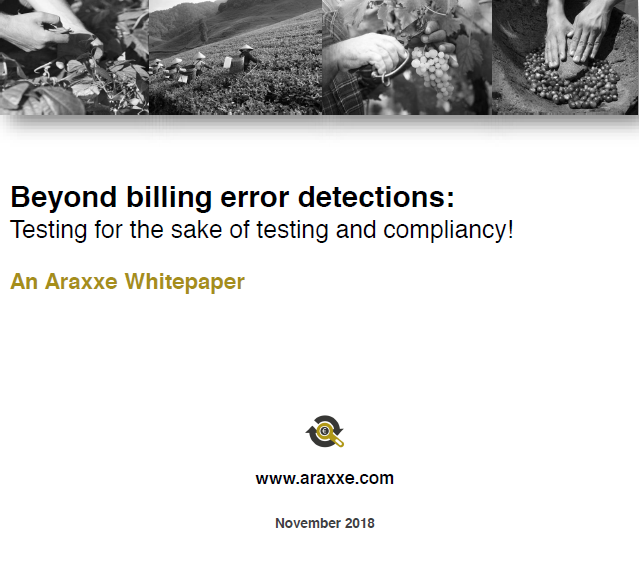 Araxxe has just released a whitepaper that provides you directions on how to use Araxxe services to demonstrate compliance by providing standardized and / or customized positive reporting. Download the whitepaper here and if you have any questions related to it or to any of our Revenue Assurance or Fraud Detection services, please don't hesitate to contact us. We will be happy to help!